In Glacier Blue with black leather interior and a black mohair hood. 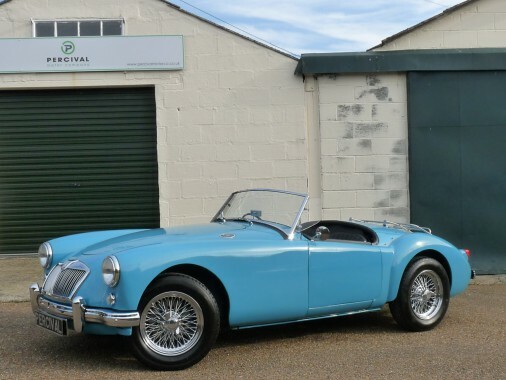 This beautiful A roadster came to the UK in 1989 and was eventually acquired by a local enthusiast in 2007 who commissioned a full mechanical overhaul and upgrade by well respected MG and Lotus specialists, Maidstone Sports Cars, in 2008. MSC fitted a Lightened and Balanced 1800cc MGB engine mated to a five speed gearbox, electronic ignition, an uprated alternator, an oil cooler, an uprated radiator with an electric cooling fan, a stainless tubular manifold and full stainless exhaust and an electronic fuel pump. They also put an anti-roll bar in with V8 inner bushes and spring pans to improve the front suspension. The A has disc brakes to the front in place of the original drums. The car has 72 spoke chrome wire wheels, a stainless luggage rack, a period radio converted to DAB and wind deflectors. In 2013 Maidstone Sports Cars carried out an extensive body restoration. The car was shot blasted and any corrosion repairs required carried out and new sills and floorboards were fitted. The work was finished off with a beautiful paint job in the car's original Glacier Blue. New interior trim and carpets went in at the same time. The MGA remains in superb condition thoughout and, whilst looking original and very pretty, is now very spritely and more than able to keep up with and cope with modern traffic. The specification is also ideally suited to longer runs and tours. A Heritage Certificate and full documentation of the work carried out come with the car.